Execution room where prisoners were killed and later buried in mass graves outside Vilnius. Objects found in these mass graves are now on display within the glass cases located across the floor of the room. The Museum of Occupations and Freedom Fights (Lithuanian: Okupacijų ir laisvės kovų muziejus), previously Museum of Genocide Victims (Lithuanian: Genocido aukų muziejus), in Vilnius, Lithuania was established in 1992 by order of the Minister of Culture and Education and the President of the Lithuanian Union of Political Prisoners and Deportees. In 1997 it was transferred to the Genocide and Resistance Research Centre of Lithuania. The museum is located in the former KGB headquarters across from the Lukiškės Square, therefore it is informally referred to as the KGB Museum. The museum is dedicated mostly to collecting and exhibiting documents relating to the 50-year occupation of Lithuania by the Soviet Union, the anti-Soviet Lithuanian partisans, and the victims of the arrests, deportations, and executions that took place during this period. Before 2018, the museum was known as the Museum of Genocide Victims reflecting a broadened definition of the term "genocide" used by the Genocide and Resistance Research Centre. Although these events considered a genocide only by a few historians, just a small part of space is devoted to the Holocaust in Lithuania, the event that is universally considered a genocide. In 2018, the museum was renamed to the Museum of Occupations and Freedom Fights. During the 19th century, Lithuania was part of the Russian Empire. The building, completed in 1890, originally housed the court of the Vilna Governorate. The German Empire used it during its World War I occupation of the country. After independence was declared, it served as a conscription center for the newly formed Lithuanian army and as the Vilnius commander's headquarters. During the Lithuanian Wars of Independence, the city was briefly taken by the Bolsheviks, and the building housed commissariats and a revolutionary tribunal. Following Żeligowski's Mutiny of 1920, Vilnius and its surroundings were incorporated into Poland, and the building housed the courts of justice for the Wilno Voivodship. Lithuania was invaded by the Soviet Union in 1940, and following an ultimatum, became a Soviet Socialist Republic. Mass arrests and deportations followed, and the building's basement became a prison. In 1941 Nazi Germany invaded the country; the building then housed the Gestapo headquarters. Inscriptions on the cell walls from this era remain. The Soviets retook the country in 1944, and from then until independence was re-established in 1991, the building was used by the KGB, housing offices, a prison, and an interrogation center. Over 1,000 prisoners were executed in the basement between 1944 and the early 1960s, about one third for resisting the occupation. Most bodies were buried in the Tuskulėnai Manor, which underwent reconstruction and host a branch of the museum. In addition to housing the museum, the building now serves as a courthouse and as the repository of the Lithuanian Special Archives. The non-violent aspect of the resistance is represented by various books, underground publications, documents, and photographs. The collection pertaining to the Forest Brothers' armed resistance includes documents and photographs of the partisans. A section devoted to the victims of deportations, arrests, and executions holds photographs, documents, and personal belongings; this collection is continually expanded by donations from the public, seeing the museum as the best means of preserving the materials. 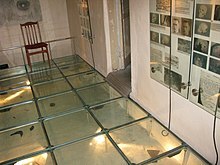 No exposition devoted to The Holocaust in Lithuania existed in the Museum of Genocide Victims until 2011, despite the fact that more Jews were killed in Lithuania than in Germany, both in relative and absolute numbers, and that only a few historians believe Soviet repression against the Lithuanians constituted a genocide. To address international criticism, a small exposition describing the Holocaust in Lithuania was added in 2011. Further, in April 2018, the museum officially changed its name to the Museum of Occupations and Freedom Fights. According to Dovid Katz, the museum is "a 21st-century version of Holocaust denial". ^ Slate: Double Genocide - Lithuania wants to erase its ugly history of Nazi collaboration—by accusing Jewish partisans who fought the Germans of war crimes. ^ a b c d Norland, Rod (March 30, 2018). "Where The Genocide Museum Is (Mostly) Mum on the Fate of Jews". The New York Times. ^ a b Andrukaitytė, Milena (19 April 2018). "Genocido aukų muziejus pervadintas į Okupacijų ir laisvės kovų muziejų" (in Lithuanian). 15 min. Retrieved 28 April 2018. ^ "The former execution camera". The Museum of Genocide Victims. Retrieved 2009-01-22. ^ Vitkauskaitė, Viktorija (2009-01-06). "Kiauros kišenės kliudo Genocido aukų muziejui". Lietuvos rytas (in Lithuanian). ISSN 1392-2351. ^ "Holokausto ekspozicija bandoma spręsti istorinį „nesusipratimą"" (in Lithuanian). Wikimedia Commons has media related to Museum of Genocide Victims. This page was last edited on 13 March 2019, at 14:10 (UTC).